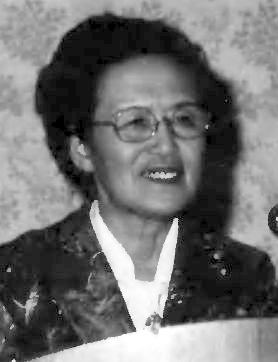 Dr. Young Oon Kim ascended on September 30, 1989. Miss Kim's legacy of love and nurturing in Father's way. Dr. Kim was a pure channel of God. Through her great mind and deeply compassionate heart God touched us, guided us, chastised us and healed us. Through her unshakable faith, God could lead her far beyond her individual sacrifices of being alone into mighty accomplishments for Heaven's sake. Her life was the stepping stone for all of us to walk towards God and True Parents. Today we pay tribute to a courageous woman who was a missionary, ecumenist, theologian and author. Our beloved sister, Dr. Young Oon Kim, lived her life simply, yet fully, for God, for all of us and for the world. Young Oon Kim came to America in 1959 and devoted the next 30 years of her full life to sharing the vision which she had received from Father and the Divine Principle. In those years she touched the lives, hearts and minds of countless men and women. Through a number of them she further extended her outreach to other nations. For fifteen years, Dr. Kim served as Professor of Theology at the Unification Theological Seminary in Barrytown. She taught courses in systematic theology and lectured on the world's religions. She authored books on world religions, on modern theology, and Unification theology. She often took her meals in the faculty dining room. There she loved to answer professors' questions about Father, his movement and the Divine Principle. She gave inspiring sermons at worship services in the seminary chapel. There, as well as in the classroom, she called all of us to the highest standard spiritually as well as academically. With complete humility she shared her experiences with God. She taught many to pray just by speaking from the richness of her own prayer life. Dr. Kim had a great sense of the value of time so she was always constructively occupied. Yet she always tended those who needed words of comfort, encouragement or counsel. She used every opportunity to "tell the story" of God's work in her life, of His work in the world today and of True Parents. • On various occasions she spoke to large groups of ministers, scholars, students and church groups. She never sought to bring people to herself but to God and True Parents. At the seminary, we were accustomed to meeting her on her daily walks about the campus. She loved the outdoors and always admonished us to care for and conserve the things of creation -- not to waste water, electricity, food or time. She was an example of healthful living with a simple diet, daily exercise, a positive mental attitude, useful work and service to others. "The Kingdom of God is the kingdom of use -- make yourself useful", she would say. Heart and intellect, word and deed, spiritual and practical were beautifully blended in her. Young Oon Kim taught by her words and she taught by her example -- her strength, her kind and gentle ways, her simple life, her industriousness, her cheerful manner, her creativity. Every age has its great men and women. We have been privileged to know and to love a great woman of our time. She comes in the tradition of Sarah, Rebecca and Rachel in the Old Testament Age, and of Teresa of Avila and Joan of Arc in the New Testament Age. Like them, she was a pioneer woman in a man's world. In spirit world she will be our advocate and intercessor. We pray that her spirit will never be far from us in the work she helped to pioneer at the seminary and in our effort to build God's Kingdom upon this earth. This is a personal reflection on Dr. Young Oon Kim as a teacher. "Teacher," of course, is one of the highest terms of respect, recognizing not only that person's wisdom and courage, but also their generosity in guiding others; "my teacher" is one to whom I am thoroughly indebted. On behalf of all of us who have been and remain her students, I would like to share these brief words of reflection on Dr. Young Oon Kim, our teacher. When our Unification Theological Seminary first opened in 1975, Dr. Kim became professor of Systematic Theology and World Religions, the only Unification Church member on the teaching faculty at that time. As textbooks, we used her book Unification Theology and Christian Thought and later her series on world religions; but we were most fascinated by her "off the record" insights on Divine Principle and her stories of Father in the early days of our movement. She encouraged us not to be bound by the letter of texts, but to develop our own inner spiritual life through prayer, meditation and reflection. A group of seminary graduates were chosen to study further in doctoral programs, so I joined several other members at Harvard Divinity School. Dr. Kim was one of the first guest speakers whom we sponsored to speak at Harvard. What I remember most about her talk is at one point, while she was speaking about God, she began to cry softly. Then she explained apologetically, "Only God; God is the only one who always makes me cry." The room was filled with the intimacy which she shared with God. One of the students who attended said, "She is a genuine mystic." When it came time for my general doctoral examinations, I decided to study Unification Theology very carefully -- from cover to cover -- during my exam preparation period. It was a great source of strength and inspiration to me. I included her books in the bibliography for my exam and discussed her work in the examination essay itself. My examiner, Professor John B. Carman, later commented in class on the significance of Dr. Kim's work in this area, as our church's primary theologian and as a woman. Dr. Young Oon Kim was a missionary pioneer in America, and a pioneering spirit in the development of Unification Theology, particularly as the foundation for inter-religious harmony and unity. "I wrote books," she said to me, "not to make a name for myself, but so that I could communicate to others beyond my limitations of time and place." No doubt her earnest desire is for us to carry forward that work. Like so many others now, I regret the letters to her which I did not write, the questions I did not have time to ask. But as she is continuing to pioneer ahead of us, I look forward to the next opportunity to discuss these things with her, in person. On January 4, 1959, Dr. Young Oon Kim came to this land of sweeping farmlands and towering cities with a keen mind, clear vision and a profound message which at that time was only partially translated into English. We cherish the times she shared the moving stories of her life as a Christian, of how she found in God and Jesus so real a savior, friend, confidant and comfort since her calling to Christianity as a teenager. Her path as a sincere and credible Christian of stature gave greater impact to the already profound message she brought to America. Here on Western soil she planted a seed of truth, nourished it, tenderly prodded its growth when it was too weak to be pushed, and then pruned it when it wavered; always a mother, she waited eagerly, prayerfully and with God's impatience for her "child" to grow. We remember her for her diligence in putting Father's message into English which duly dignified and communicated its profundity. She was always seeking ways to convey the beauty and depth of concepts that the English language had no words to describe. She typed manuscripts, giving out copies of completed parts of The Divine Principle for her students to read. When the completed book was finally published, she painstakingly pasted corrections over errors, always with the vision that this written word would multiply and reinforce that which was spread through the spoken word. Dr. Kim taught us that learning to master human relationships is an essential key in a person's religious life and spiritual growth. She had accepted the call to bring the Principle to the Western world where she consciously sought people who were trustworthy in dedication, responsible in their activities and capable of carrying out the mission. To someone who knew the incredible suffering of the Korean people, Father and the early disciples, she could only have felt that we Americans were shallow and immature. Undefeated, she pressed on, in constant hope of finding those to whom she could give spiritual responsibilities of not only this nation, but all the western world. In Father's tradition, she sacrificed her early foundation for the sake of the world, sending the earliest disciples to Germany, Austria, Italy, England, Spain and Holland to pioneer our movement. Dr. Kim herself pioneered in England for a period of time. Forever frustrated by the lack of money in the midst of a land of plenty, Dr. Kim sought ways to support the work without financial assistance from her homeland. She carefully and frugally arranged her life so as to keep her immigration status intact by being a full-time student, receiving room and board by caring for children, yet still squeezing out precious little time for writing and witnessing. We can only shamefully realize how much we owe her when we think of these days. She taught us to love and to follow with the same single-minded faith she held. She touched the lives of many members, enabling them to inherit her understanding and incorporate the Principle into their very souls. For me, remembering Miss Kim is like listening to a Baroque fugue. At its best Baroque music is a powerful integration of passion and precision. J. S. Bach, one of its mightiest practitioners, declared, "Everything I do is for the greater glory of God." And yet to perform Baroque music as it is today emphasizing technique over passion is to miss its power, majesty and soul. Similarly to remember only the precision of Miss Kim's sharp mind or the chastising with her index finger is to remember only half the person. Like Bach, Miss Kim lived for the greater glory of God. Her passion for Heaven, for Jesus and for True Father was intense and internal. As a child, she developed a habit of keen observation and equally keen probing for meaning through which Heavenly Father could guide her. He had known her long before she knew Him. He stimulated her mind to question, to search. He also stimulated her heart to restless yearning. To participate in such an internal and profound love with Heaven must have been powerful motivation for the shy and sensitive young woman. Mystics like Teresa of Avila and John of the Cross write of ecstasy and exaltation during the unfolding of their relation with Heaven. They describe that relationship in terms usually applied to physical love, which suggests the profound and transforming nature of their communion with Heaven. Miss Kim also experienced such an intimate, mystical union with Heavenly Father which provided the meaning and vocation of her life. I had always been drawn by her purity and by her direct relationship to Heavenly Father. When she had questions, she prayed and received direct answers. This had been true in my own life as well. In addition, my earliest understanding of Heavenly Father and the spiritual world was provided by Emanuel Swedenborg's explanations. His ideas also exerted a strong influence on Miss Kim. Thus I embarked upon our time together with anticipation of interesting discussions. At this point in my life, I was already an adult and not inexperienced either as a cook or as a driver. However I tried to accept all of her instructions and her laughing explanation that she was teaching me to be a housewife. I consciously decided to unite with her as deeply as possible to restore my relationship with my physical mother and to inherit as much as possible from Heavenly Father through Miss Kim. When we worked on her correspondence, sermons or the beginnings of ideas for later books, the pattern was the same as with preparing food. She wanted everything done precisely her way. The extent to which I complied initially determined the extent to which she listened to me later about an alternate idea. I remember one time sitting embarrassed on the floor of her room as she started enumerable sentences, then looked expectantly at me waiting for me to complete her thought. I made suggestions but they didn't please. As the tension and discomfort mounted, I finally suggested that she tell me what she generally wanted to say then let me receive the specifics from Heavenly Father. She shushed me and continued this painful exercise. Several hours passed but there were no letters ready to mail and my eyes brimmed with tears of frustration. Finally she tried the 'for instance'. She asked me "If someone wrote you such and such a question, how would you answer?" When she was satisfied with my theoretic al response, she handed me the letter and said, "You write that." I had a few moments to jot down the reply before she posed the next 'for instance'. Each time we went through this process, it became quicker and less painful. Finally, she wanted to write a sermon on Jonathan and David, the Biblical story of friendship. She opened her Bible and read several verses from I Samuel to me. She mentioned several points she wanted to emphasize -- their loyalty, Jonathan's love for David as his own soul. I reread the Bible, prayed, thought about Korean social values and of Miss Kim's nature, made some notes and began to write. After a few days, I returned with a sermon. She motioned for me to wait while she read it. When she finished, she tipped her head so she could smile at me over the top of her glasses and said in a surprised voice, "That's exactly what I wanted to say. So that's how you work." The fact that she finally under- stood how to best use my researching and writing skills enabled us to produce her papers and sermons more quickly. She asked me to read theological books to her in the afternoons, starting with German systematic theologians. Then she switched to Swedenborg. She began explaining his concepts to me, to re-familiarize herself with his ideas. Gradually she probed deeper into his beliefs until we had one of the most illuminating discussions, comparing and contrasting Swedenborg's ideas about creation and the spirit world with True Father's. As she realized the extent of my familiarity with and understanding of his works, she would allow me to occasionally suggest passages and even alternate interpretations. Her understanding of him was both highly logical and deeply intuitive. She revered him as a teacher and a man obedient and humble to Heaven. She was quick to integrate new information and to restate her understanding. Through her crystalline perception, I gained a much broader and deeper perspective on Swedenborg. When she began to contrast True Father with Swedenborg she showed an even greater excitement, for True Father had come not only to teach, she stressed, but also to actively carry out Heaven's Will. The Divine Principle is more specific and concrete than anything Swedenborg stated. She also contrasted True Father's urgency in explaining the goal of human history as the establishment of God's Kingdom with Swedenborg's more philosophical view of history. Her eyes shown and her cheeks glowed during those afternoons, because she was inspired and filled with joy. The once overly precise aspects of her character were absorbed, the jabbing finger was now part of the whole hand making broad and graceful arcs of emphasis. She explained how a true experience of God opens one to the world, drawing examples from her own testimony, Jesus' life and Mother Teresa. She recalled True Father urging members to experience broad ranges of feelings to know the depth of Heavenly Father and so they could build a multi-faceted Kingdom of Heaven. She held a deep respect for True Father because of all he had endured for Heaven. Their internal unity was crystal clear. Our relationship entered a time of harvest. She trusted me with the correspondence, and in the afternoons when people dropped in for tea, she invited me to sit down rather than just serve the tea and leave. Once when I was sick she prepared food for me. One afternoon hearing me singing, she came in, looked around and asked, "Who are you singing to?" Pointing upwards, I said, "Heavenly Father." She smiled, hummed along in harmony to the end of the song and then returned to her room. We seemed to have attained a certain level of harmony and trust. Today when I reflect on those few months with Miss Kim, I am so grateful. Although a few instances were painful in the extreme, I gained confirmation of my deepest intuitions about Heaven's love for mankind by understanding His love for this one sensitive and vulnerable woman. It was Miss Kim's passion for Heaven, her honesty and deep desire to do His will which enabled her to be led by Him. She used everything that she possessed to serve Him. We who come after her bear the responsibility to broaden her base of deep sacrificial love. We are indebted to Miss Kim for she came first to open the way for us. She will always hold this treasured pioneer position close to Heavenly Father. 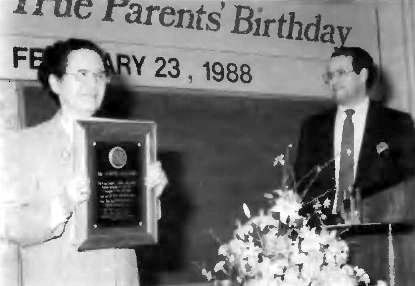 Farley Jones looks on as Dr. Kim holds the plaque he presented to her at her farewell celebration in New York on Feb. 23, 1989. Today, we have come to honor a truly great spiritual person. I believe that she ranks with the great spirits in history. She was a teacher her whole life. As a teenager, she had this profound experience with God, after which she joined a Methodist church. She had profound personal experiences with Jesus after that, and while she was working in a bank, she heard a voice that said, don't work with dead numbers, work with people. Thereafter she changed her occupation and began to teach. She taught children in Korea, and when she came to this country she taught Divine Principle. And she was not just a missionary who lived a normal kind of missionary life. She invited people to live with her, day and night, and through her life example she taught people. She was a spiritual teacher who led people to grow spiritually. She ultimately became a theologian and an author and she taught theology at the UTS. So, she was always teaching, and I thought today we could reflect not just on what she taught during her life, but rather, what we can be taught by her life. I want to share three main points about her life. First, she was a very humble woman. Even though I and many others saw her as a great light, that is not how she thought about herself. Several times, I would be with her, and in response to certain situations she would say, "I am not so special, I am not so great." I remember one time when she said, "I am nothing." That is how she thought of herself. So you have this paradox in a woman of true greatness, who came as a solitary, middle-aged lady to this vast country. As a missionary, she took on the challenge of the United States, and stuck it out through all sorts of hardships. You know all the difficulties, ups and downs you have in your own spiritual life. You can imagine her challenges as the first missionary persevering through many advancements and stages. Yet she had this perspective of herself that she was nothing. I've heard it said that true greatness and humility go together, like two sides of the same coin. But we can ask, "Why would she think that way about herself?" One probable reason is that she may have compared herself to the great things that she was asked to do. God didn't ask her to do just one thing, for example, simply be a missionary. She was the one in California who read the necessary legal texts and figured out what was required in order to incorporate the Church. So she was not just a missionary but fulfilled many different roles as an administrator, an author, a theologian and more. God required this of her and in that context, she may have felt that her accomplishment was not so substantial. But she was made great by these great things that she was asked to do. Do great men create history, or does history produce great men? Was Abraham Lincoln great because he was inherently great, or because of the challenges he faced? Well, there is probably give and take between those two elements. But certainly in Miss Kim's case, it was her whole-hearted response to the great things that she was asked to do that made her great. The key thing here is her response. As she herself said, she had a great sense of internal responsibility, and once she started something, she couldn't stop. That was her attitude and spirit. By taking responsibility for the task of initiating Divine Principle teaching in America, she became who she was. We are now in the age of tribal messiahship, but Miss Kim was a tribal messiah; I am one of her tribe. There are others here who are direct descendants of her tribe. She established this foundation and in a sense pioneered the way of tribal messiahship, in her own age and time. And she did it not as a young woman. She was born in 1915, and she met the Church in 1954-55, when she would have been about 40. She lived under the same roof as Father for four years, coming to America when she was 44 years old. That is when she began her missionary work. Many of us have quite a few years in the Church and haven't even reached the age of 44 yet. So we need to think that this is only a prelude; the greatest accomplishments are still ahead of us. We need to feel that there are still great things for us to do. What Father is asking is that we take on the great things that are to be done in this nation. I am now 46, and saying to myself, "Well, she began her work when she was two years younger than you." So I want to make a new beginning, as I remember the passing to the spirit world of this first missionary to our country. I am young enough. And so are you. So the first lesson that I want to draw from Miss Kim's life is that through whole-hearted response to great challenges we can become what God wants us to become. The second point, and I think this is the one which she would want to articulate if she had some final words to say, is about friendship. Many of you have seen the video, "Faith and Reality". She is on that video, which is a survey of the life and work of Father. In that hour-long video, there are comments, testimonies, and reflections by various people who have worked with Father over the years. Toward the end of the video there is a shot of Miss Kim walking on the grounds up in Barrytown, NY, at UTS, and her voice is heard saying, "If you passionately love people, God comes so close." I think that this was her most frequently made point over the past five years of her life. She would say things like, "Position is not important, your identity, or what you have accomplished. What is important is love for other people." And this point she iterated and reiterated, because, I think, it was the conclusion that she came to reflecting on her own life. That life, of course, was one of great accomplishment. But even in the context of great accomplishment, and a life of very dignified and respected positions, the conclusion she emphasized was the most important thing is love for others. I remember, in the late 60s or early 70s, a sermon that she gave on the friendship that existed between Jonathan and David in the Bible. She gave a whole sermon on that friendship. Over the years I noticed how many friends Miss Kim made with people of all walks of life, from the youngest member to the oldest senior Korean elder. And Dr. Kim was not simply our Abel figure or our channel to God, not that kind of thing. We came to feel of her that she was a friend. I'd like to read from her testimony, reflecting on her time in Oregon: "By this time I had a room in a woman's club. I had to pay 15 dollars a month rent, but no one knew my financial situation. Without my saying anything, Galen Pumphrey, an early American member, invited me to come to live with him in one of their houses, so that I wouldn't be alone. Also, George Norton stayed with me and bought my food. Through George and Galen, these early American members, I was supported. It was there that I retranslated the Divine Principle. We were trying to find money to print several hundred copies. Faithfully and verily, these friends supported me." Jesus says in John 15:10, "If you keep my commandments, you will abide in my love, just as I have kept my Father's commandments and abide in His love." In shared commitment to the will of God, the highest friendship is possible. That is the kind of friendship that Miss Kim formed with so many people. They were friendships in which the spirit of God dwelled. Also, the achievement of that kind of friendship with others is an expression of high spirituality. It was not that she elevated herself. Rather people came to feel of her as a friend. I think that is a profound testimony of her spiritual stature. So the formation of these kinds of relationships is what we should always have in mind. Not everyone is going to form friendships with every single person in this Church, but still there are people that we are meant to relate to. If' we can have this kind of heart and love substantial friendships can result out of that love. The final point I want to make about her love is a poignant one. She brought the Divine Principle to the United States. We know that the Divine Principle is a family theology. It emphasizes the base of four positions: the unity of God, husband, wife and children. The central thrust of Father's teaching is the realization of true love in the family. It is a great irony that this woman who brought this vital teaching to America was herself never able to have her own family life. One time, fairly early on, when I was living in the church center in Washington, DC I remember sitting around a table with Miss Kim and some other members, and she made the comment that God was selfish. My jaw dropped. I said, "Are you saying that?" She looked at me very unequivocally, with no doubt in her mind, and said, "Oh yes." W ell, I think I now know why she said that: God claimed her life for his own, even in the context of our theology that emphasizes marriage and family. I believe He really sacrificed that dimension of her life for a larger purpose, and that purpose was this nation. I think we need to remember this sacrifice of a woman who brought the teaching that elevated the value of the family. Of course she was blessed in many ways, but she did not have a family life and her own physical children. I think those things were sacrificed for the importance of her work in this nation, and for the importance of this nation. So we need to be challenged by that and take that to heart. Her passing on September 30 was not an occasion to grieve. I went to Korea beforehand to visit her and to say good-bye. She was in pain and worn down by her illness. Her passing into spirit world is really an occasion for joy and celebration. This is a time to remember her and what her life teaches us, and try to inherit something from this great person who God gave to us and who gave herself to us. Let's rededicate ourselves with the dedication she herself had for America. Let us go forward ourselves to lift up this land and bring a new vision and health to this country. Thank you.